A journey to four continents and 35 countries is promised to the visitors to the 6th Thessaloniki Biennale of Contemporary Art under its title “Imagined Homes”, through the works of 95 individual artists and groups participating in this year’s main exhibition and performance festival. One month prior to the official opening of the main exhibition of the Biennale, which celebrates its 10th anniversary this year, the State Museum of Contemporary Art (SMCA), in its capacity as organising body, hereby announces the names of the participating artists who will present their works in four venues in Thessaloniki: at the SMCA’s site at Moni Lazariston, the Contemporary Art Center of Thessaloniki at Warehouse B1, Thessaloniki port, in the premises of the Macedonian Museum of Contemporary Art and at the Mount Athos Center. Additionally, the SMCA announces the artists participating in the Thessaloniki Performance Festival, which forms part of the main program of the Biennale, alongside the artists’ residency program, events, exhibitions by the Movement of the 5 Museums of Thessaloniki, and educational activities for children and adults. The parallel program includes self-funded exhibitions and events that are presented under the auspices of the Biennale. The Thessaloniki Biennale of Contemporary Art is co-financed by Greece and the European Union (European Regional Development Fund). Participating artists hail from Austria, Belgium, Bulgaria, China, Colombia, Cuba, Cyprus, the Czech Republic, Finland, France, Germany, Hong Kong, India, Indonesia, Iran, Israel, Italy, Latvia, Morocco, New Zealand, Norway, the Philippines, Romania, Russia, South Africa, Serbia, Slovakia, Spain, Switzerland, Sweden, Tunisia, Turkey, the UK and the USA. 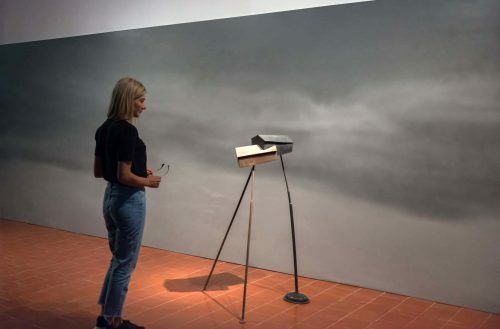 All of the artists were either selected by the curatorial team of the Biennale, responded to the Biennale’s open call (in Nov. 2016), are participating in the artists’ residency program or the performance festival, or were due to participate in the Çanakkale Biennale last September and are now hosted by the Thessaloniki Biennale. They all respond to this year’s theme, taking as a starting point the current attention on the immigration problem, focusing at the same time on the fluidity and constant redefinition of the home as a concept. Giorgos Alexandridis, Babis Alexiadis, Halil Altindere, Einat Amir, Arushee, Oreet Ashery, Younes Baba-Ali, Dora Belegrinou, Natasa Biza, Eva Borner, Alkis Boutlis, Ascan Breuer, James Βridle, Myriam Chaieb, Bo Choy, Dionisis Christofilogiannis, Raffaella Crispino, Sophie Dubosc, Ahmet Elhan, Alessandra Eramo, Dimitris Fragakis, Alicia Framis, Alexander Glandien, Dylan Graham, Chaja Hertog & Nir Nadler, Paolo Incarnato, Dzamil Kamanger & Kalle Hamm, Reysi Kamhi, Akis Karanos, Fotini Kariotaki, Norayr Kasper, Sharlene Khan, Peggy Kliafa, Gustav Klucis, Panos Kompis, Mikko Kuorinki, Sotiris Lioukras, El Lizzitzky, Andreas Lolis, Orly Maiberg, Kazimir Malevich, Panos Mattheou, Oleg Mavrommati & Boryana Rossa, Agnes Meyer-Brandis, Vladimir Miladinović, Sherry Millner & Ernie Larsen, Marina Naprushkina, Kristian Nemeth, Pavlos Nikolakopoulos, Fotini Papahatzi, Nefeli Papadimouli, Eva Papamargariti, Kostas Pappas, Kosmas Pavlidis, Martha Rosler, Xenis Sachinis, Deniz Sağdıç, Mark Salvatus, Sermin Sherif, Walter Solon, Efi Spyrou, Tatiana Stadnichenko, Stefania Strouza, Constantinos Taliotis, Dimitris Tataris, The Kingdoms of Elgaland-Vargaland, Antigoni Tsagkaropoulou, Giorgos Tserionis, Andri Tsiouti – Michalis Charalambous – Giorgos Stylianou – Stefanos Papadas, Stefanos Tsivopoulos, Mona Vatamanu & Florin Tudor, Marian Wijnvoord, Ino Varvariti, Loukas Venetoulias, Babis Venetopoulos, Arseny Zhilyaev.